Day 1: Arrive ChengDu. Pickup from airport and transfer to your hotel. Welcome dinner at night (hotel). Day 3: LiuJiang old town - GaoMiao - Mt ErMei. 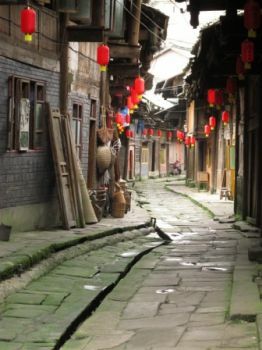 Drive to GaoMiao to visit this ancient town, and the source of the HuaXi river. We continue our journey to the foothills of Mt ErMei, QingYingGe (hotel). Option: You may choose to take on the 12 km (3 hrs hike) from LiuJiang to GaoMiao. Day 4: BaoGuoSi - WanNianSi - LeiDongPing - Summit. Take the local tour bus within Mount ErMei. You will also take the cable-car ride to visit WanNian temple and other sights along the way to the summit. In between the sights, you will go for short hikes not exceeding 2 hrs(hotel). Day 5: Summit - Ninety-nine bends - BaoGuoSi. Wake up early morning to view the spectacular sunrise on the golden summit. After breakfast, you can either hike downhill or take the cable-car and local tour bus back to the foothills at BaoGuo temple (hotel). Day 6: BaoGuoSi - Mt ErMei - LuoCheng - QianWei. After breakfast, drive about 2.5hrs to visit LeShan Big Buddha. We will continue onwards to visit LuoCheng, a unique ship-shaped old street bustling with old people drinking tea and playing cards. We will drive to QianWei town for the night (hotel). Day 7: QianWei - BaJiao valley coal mine - QianWei. Take a ride on the world’s only functioning steam-locomotive. This small train will bring you deep into the valley. The end point is BaJiao valley where the old coal mine is located. In the afternoon, take the train back to QianWei (hotel). Day 8: QianWei - ChengDu. Transfer to your hotel in ChengDu (hotel). Day 9: Depart ChengDu. Send-off to the airport for your departure. - Others Item not mentioned.